Issa star in the making! Baby Kaavia James Union Wade is only 4 months old, but she's already slaying magazine covers. 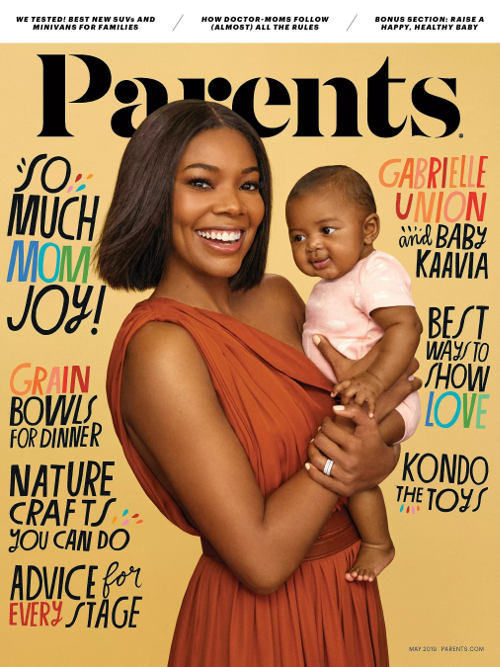 Gabrielle Union and her adorable baby girl front Parent Magazine's latest issue. We're used to seeing Baby Kaavia with her "Shady Baby" side-eye via her own Instagram page (which has over half a million followers), but baby girl served up a few smiles for the cover and accompanying spread. In the cover story, the "Being Mary Jane" star talked about how she struggled through a phase where Kaavia wasn't napping. Like most new moms, she was overwhelmed by it all, however, she found a way to master quick daily routines. Gabby - who is one of two new judges on the new season of "America's Got Talent" - admitted motherhood definitely was a learning curve, but she's picking up tips that work for her and her new baby. The new mom - who tragically suffered several miscarriages before choosing the surrogate route - said she's not focused on being a "perfect parent" and that's totally OK.
Gabby's NBA baller husband Dwyane Wade - who's finishing up his last year in the league - is very hands on, so much so, she has dubbed him a "stage mom." “Dwyane is like a stage mom. He’s very hands-on. When he’s in Miami and we’re in Los Angeles, he wants to know everything, from her poops to what outfit she’s wearing,” she shared. By the way, D. Wade took two weeks’ paternity leave, a rarity in the pro-sports world. Aww! Read Gabby's full interview here. They may be young, but these two young, black Hollywood actresses are smart, unapologetic and fearless. Wise beyond their years, "black-ish" star Marsai Martin and Dumbo's Nico Parker (daughter of actress Thandie Newton and director Ol Parker) are two 14-year-olds who are changing Hollywood. 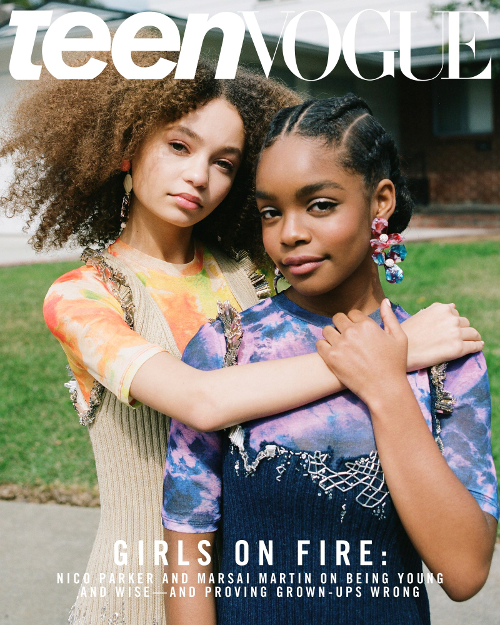 The YBF starlets front Teen VOGUE's March/April 2019 issue. “Everyone thinks you have to grow up to know who you are, but kids already know who we are. The world just beats it out of us,” Marsai Martin told the magazine. And she's right. As a kid, we already know what we want to do with our lives, but as you get older, the world invades your thoughts and dreams and has you second guessing what you really want to do in life. "The first time I was in Universal, I was 10, and I [was wearing] this blazer," Marsai told Teen Vogue. Thanks to her acting and producing experience, she’s more confident these days. "Now, it's like I come in with sweats and with a hoodie, and I'm just like, 'So, here's what's going down, guys.'" Marsai - who's starring and producing upcoming comedy LITTLE - founded her own production company, Genius Productions, in 2017. Since then, she signed a first-look deal with Universal for scripted projects. And she's all about helping the next generation coming up after her. "We need more of those characters that lead by example for people coming up next to us," Marsai said. The LITTLE actress is not showing any signs of slowing up either. She’s already turning her attention to future projects, like her next movie with Universal, a comedy she pitched called StepMonster where she'll play a teenage girl who tries to make her dad's new love interest disappear. Nico explained that just because she's young, doesn't mean she's not well informed on what's going on in the world around her. "For young people, it's often said that we're always on our phones, and we're not aware of our surroundings, and we're not aware of what's going on in the world," Nico said, adding that especially for herself, "it's the complete opposite." As she gets older, she's finding her voice and learning to speak out on whatever she believes in. "When I was younger, in my friend group, I was quieter. I wouldn’t really step on anyone’s toes," Nico says. "As I’ve gotten older, I’ve learned that if I think I’m right, or if I know my opinion, I’m not afraid to stand up for what I believe in." You can read the girls' full interview and peep more of their flicks here.